While most RSS readers are still stuck in boring item by item layouts, Glasshouse Apps takes things to the next level with its first iPad app called The Early Edition. The app takes RSS news back to the times before computers and websites took over and transforms your favorite feeds into a virtual newspaper created in real time from sites you care about. The design of the The Early Edition is creatively styled and a delight to use. Tapping on any headline lets your read the full story or view the original page from within the app. Here you can quickly share any story via email, open it in Safari, or copy the link. 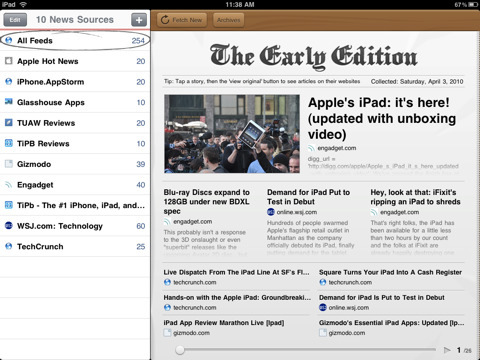 The Early Edition also has built in support for Instapaper which is a big plus. When you’re done, you can get back to your newspaper to continue reading the rest of your stories. You can scroll down and read the full story inline as well without having to go to the details section. The paper layout has information about when it was created (last updated) and a quick tip about the apps. You can manually update the stories by tapping the Fetch News button. The Early Edition even stores Archives of your previous daily newspapers, so you can view them by date at any time, in case you miss one. In landscape view, the left pane displays your news sources with number of stories per feed. You can create a newspaper for all feeds, or filter by individual feeds. Tap edit to add new feeds or delete existing ones. The Early Edition ships with a handful of interesting feeds out of the box to get you started. Adding new feeds is a manual process at this point which can get tedious, especially if you follow lots of sites. What’s currently missing is support for Google Reader, and for OPML Import/Export, although the developers have stated that upcoming versions will have Google Reader support. Font types are not customizable as of now. Using The Early Edition is pure bliss. While most newspaper companies are struggling to stay in business, this iPad app takes what we loved about newspapers and gives us a way to consume them again in their classic format with relevant content. The app’s performance on the iPad is fast. On the first launch you’ll notice a nice wooden background graphic while all your feeds are being morphed into your Early Edition. Webapps like the Google Reader Play helped start thinking outside the box when it comes to RSS fees, and now The Early Edition app for iPad has upped the ante with superior layout, graphics and performance. AppSafari review of The Early Edition was written by Joe Seifi on May 4th, 2010 and categorized under App Store, Featured, Feeds, iPad apps, News, Reading, Utilities. Page viewed 4142 times, 1 so far today. Need help on using these apps? Please read the Help Page.